ENDTIME PREACHERS: God Is Amazing! God is Truly Amazing! Only a blinded fool would reject the reality of a God Who created the universe. Can you imagine a supernatural being so powerful as to create a universe by the Word of His mouth? 2nd Peter 3:5, “For this they willingly are ignorant of, that by the word of God the heavens were of old, and the earth standing out of the water and in the water.” God is truly amazing! Do you have any idea how much energy there is in the universe? Just one average sized tree contains enough atomic energy to supply all the electrical power in our nation for 10 years!!! “Yes, our universe is very large, but there is still more to it than what you probably realize. Most people have never considered the amount of energy needed to create a single atom. Powerful bonds hold atoms together and when these bonds are broken, a tremendous amount of energy is released. This energy can be calculated by using Albert Einstein’s historic E=mc2 (See footnote #2 below for more information). For example, the atomic energy stored in 1 gram (.035 ounce) of matter is equal to the power obtained from 700,000 gallons of octane fuel. (Source: ChemCom, page 309.) For a more dramatic example, the atomic energy stored in the atoms of a 200-pound man is equal to 157,307 atomic bombs (the ones dropped on Hiroshima). For you weightlifters, that's the same as bench-pressing a 500-pound weight over 12 million billion times. If there is that much atomic energy in a 200-pound man, imagine how much energy was needed to create the whole universe. Imagine the magnitude of the God who created all this. I find it amazing that people actually have the audacity to say that they will boldly stand up to God when they enter eternity. They obviously don’t comprehend the God who created them. God is an awesome God! Praise the name of Jesus my Lord! The Godhead became flesh in the man Christ Jesus, and we beheld His glory as of as the only begotten Son of God (John 1:14). Jesus was more than a man, He was the God-man (100% man and 100% God in the flesh). The Godhead walked this earth in the body of Jesus Christ (Colossians 2:9 - King James Bible), He lived a sinless life, and then He went to the cross to pay for our sins! Amen! What if there is no God? Could the universe surrounding us have just "happened?" Could it be that all of the planets are aligned in perfect balance just by chance? Could it be that the sun is a perfect distance from the earth by chance? 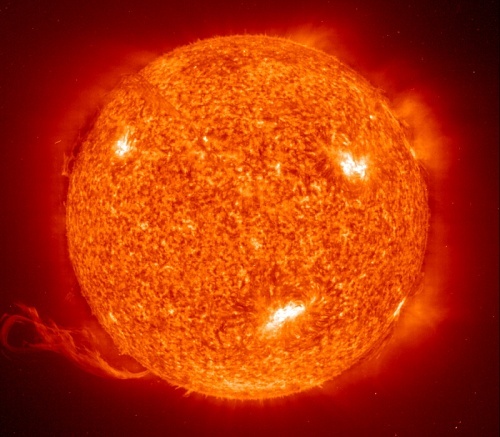 The planet Mercury's hot side reaches a scorching 800 degrees Fahrenheit. Yet the planet Pluto is so cold that it has an atmosphere composed of gel. Think of all the millions of stars and planets, isn't it strange that the ONLY life is found in earth? How can this be? You'd think that some type of "life" would exist in other parts of the universe. Even if we try to imagine there is no God, the universe around us is a constant testimony of God's presence, power and goodness. There must be a God! It is the ONLY logical conclusion. The Bible itself declares that the universe around us testifies of a Divine Creator. If there is no God, then why are there Satan worshippers and the occult? That question is an interesting one indeed. I could understand a Christian doing what they doing because they are anticipating greener pastures when they die and go to heaven. But why would anyone be involved in the occult or Satan worship if their only future is in hell? I mean, the Satanists do believe in a Divine Creator. So why would they spend their lives making God mad by spiting Him in rebellion. I could understand someone not wanting to believe in God at all, but why worship the devil if you do believe in God? It just doesn't make any sense. God is truly incredible! 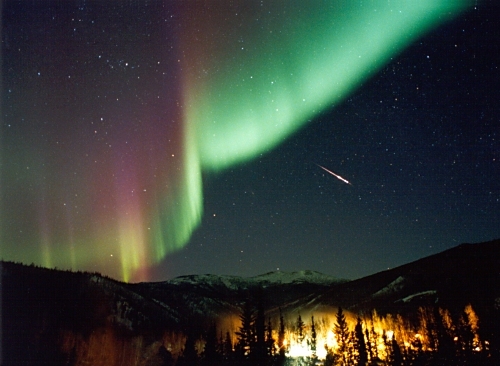 The photo above displays the Auroral lights over Alaska... God's light show. “We usually think of the stars as being loosely scattered throughout the vast expanse of outer space. As you can see from the picture at the beginning of the chapter, these stars are not "spread out," but are "lumped" together in confined groups called galaxies. These confined groups, however, are still enormous in size. Our galaxy (the Milky Way), for example, is over 90,000 light years wide. This means if you were traveling at the speed of light (186,282 miles per second) it would take you 90,000 years to get from side to side. For you joggers, that’s a distance of over 500 million billion miles. Although our galaxy is incredibly huge, it is only a small spec in comparison to the rest of the universe. There are at least a 100 billion galaxies in the universe. If the Bible was written by men, then why does it prompt us to seek forgiveness from a Divine Creator? Why would men write such a fairytale condemning all of humanity to Hell? Has anyone ever written a book such as the Bible? Archeologists and explorers have been discovering thousands of scrolls, tablets and fragments of the Bible for centuries. People have uncovered all of these findings in scattered places throughout the Middle East, in multiple languages. Can any book throughout history claim such remarkable exposure? And if men did write the Bible without ant Divine inspiration, then how did the forty Biblical writers, over 1,500 years of history, manage to complete such a seamless masterpiece of prophecy? The Quran can not claim this, it contains no prophecy. God is Amazing! I am always intrigued, captivated, and stand in awe when I consider the universe. What was God thinking? Did He really create all of those stars (the nearest star to earth being 4.24 light years away) just for mankind to have a night light? (Genesis 1:14-19). Yes, that is what the Bible teaches. God gave us the sun, moon and stars. This is why mankind will NEVER find any intelligent life in the universe apart from the earth. God created it all for us. Can you image? God created the stars for you and me to look at during the night sky. Don't miss the greatness of this. Do you have any idea how many miles are in one "light year?" There's 5,873,327,712,000 miles in one light year!!! That's five trillion, eight hundred and seventy-three billion, three hundred and twenty-seven million, seven hundred and twelve thousand miles!!! Now multiply this times 4.24 light years to see how far the NEAREST star is to the earth. The nearest star to earth is an astounding 24,902,909,498,880 miles away!!! Wow! I don't know what to say! It's mind-boggling to say the least. That's almost as much as the national debt. Wow! Isn't God Amazing!!!!!! 3 August 2004 | This NASA/ESA Hubble Space Telescope image reveals a pair of half a light-year long interstellar 'twisters', eerie twisted funnel structures, in the heart of the Lagoon Nebula (M8). The central hot star, O Herschel 36 (shown here on left, red), is the primary source of the ionizing radiation for the brightest region in the nebula, called the 'Hourglass'. 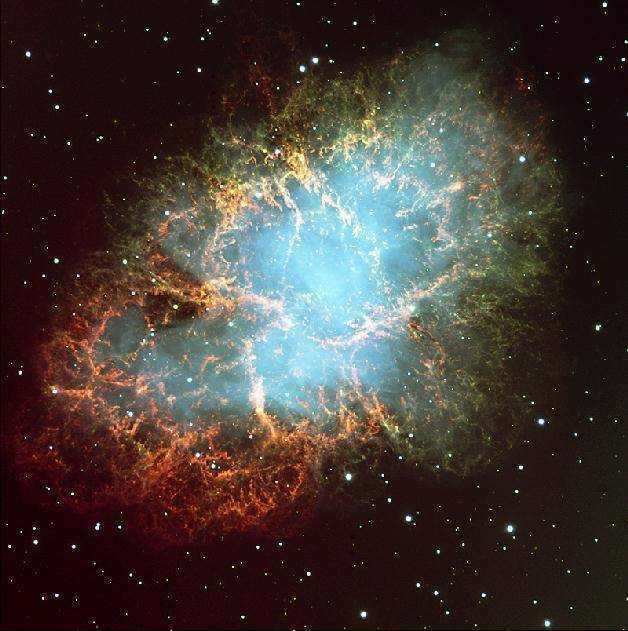 Other hot stars, also present in the nebula, are ionizing the outer visible parts of the nebulous material. This ionizing radiation heats up and 'evaporates' the surfaces of the clouds (seen as a blue 'mist' at the right of the image), and drives violent stellar winds which tear into the cool clouds. Analogous to the phenomena of tornadoes on Earth, the large difference in temperature between the hot surface and cold interior of the clouds, combined with the pressure of starlight, may produce strong horizontal 'wind shear' to twist the clouds into their tornado-like appearance. 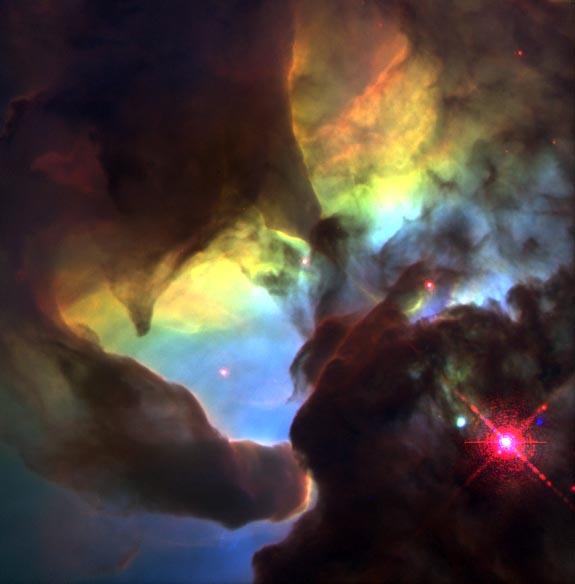 The Lagoon Nebula and nebulae in other galaxies are sites where new stars are being born from dusty molecular clouds. These regions are the 'space laboratories' for astronomers to study how stars form and the interactions between the winds from stars and the gas nearby. By studying the wealth of data revealed by Hubble, astronomers will understand better how stars form in the nebulae. These color-coded images are the combination of individual exposures taken in 1995 with Hubble's Wide Field and Planetary Camera 2 (WFPC2). So the next time you gaze up into the night sky and see the stars, just realize that the NEAREST star is about 25 trillion miles away. If that's not amazing enough about God, then consider this...the FARTHEST known star from the earth is a staggering 13,230,000,000 light years away!!! That's 77,704,125,629,760,000,000,000 miles away!!! Ok here goes... that's seventy-seven sextillion, seven hundred and four quintillion, one hundred and twenty-five quadrillion, six hundred and twenty-nine trillion, seven hundred and sixty billion miles away!!! I don't even think the U.S. government could ever squander that much money, but if anyone could it would be them. Wow! 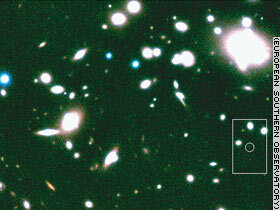 Named Abell 1835 IR1916, the newly discovered galaxy is located about 13,230 million light-years away. How can anyone observe the universe and deny the existence of God? I could not be an atheist even if I tried my darndest, I just couldn't. Only someone who was willingly blind would deny that there is a Divine Creator Who constructed the universe. There is harmony and structure to life and creation. If evolution were true, then we should be observing new life forms in their primitive forms. ALL of the theories on evolution have eventually been shot full of holes. Science especially has proven evolution to be a lie because evolution is only based upon unproven theories. Evolution is NOT science, it cannot be monitored or studied. Evolution cannot be tested. Evolution stares directly in the opposing face of God's Word. The following truth is mind-blowing. The image below was only made possible by pointing a camera in one direction and allowing 100 hours of exposure. As you can see, there are hundreds of galaxies, each containing billions of stars (suns). The amazing photo below is only the size of a grain of sand in the sky. Can you imagine? "The powerful Hubble telescope was pointed to a "dark" spot near the Big Dipper and took the photograph below. This deep field photograph captured previously unknown galaxies residing deep in the universe. No other telescopes has the power to be able to see galaxies this far away. These galaxies are so far away, it took 100 hours of exposure time to take this picture. Photo by NASA 1995, Hubble telescope. The above photo was only made possible by leaving the camera shutter open for 100 hours. The section above represents a size of sky about the size of a single grain of sand. God is truly amazing. Some galaxies have billions, even trillions of stars (suns). “Although the Hubble telescope is very powerful, it still cannot see the "far edges" of the universe. We have no idea of what’s behind the galaxies in this photo. What would we see if we had a more powerful telescope? I believe if we were to point it to a "dark spot" between a couple of these galaxies, we would probably come up with a photograph full of newly discovered galaxies. Nearly every object in this photograph is a galaxy with hundreds of billions of suns. 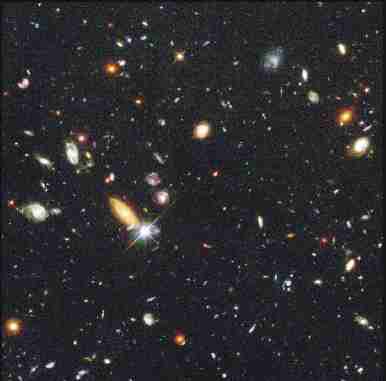 (The poster version of this photograph shows many more galaxies than this low resolution Internet photograph.) Considering the tremendous size of a single galaxy, this photograph represents a very large expanse. Take a few moments to reflect on this. Light from the farthest known star from earth would take about 477 million years to reach the earth. Contrary to what astronomers say, you are not looking 477 million years into the past. The Bible dates creation at around 4,000 BC. The Bible records the creation of all stars on the fourth day of creation. So at the oldest, you might be looking back into time a little over 6,000 years. The evolutionists and astronomers that don't know God can laugh at such a statement, but I am certainly in harmony with the eternal Word of God. God created all the stars with light already present at the earth. For the unbeliever such truth may sound preposterous, but it is the plain teaching of the Scriptures. God created the stars for mankind, to provide light in the night skies. This light was already present when God created man on the sixth day of creation. I believe the Holy Bible! Of Jupiter's astounding number of moons (dozens) orbiting around it, MOST of them weren't even discovered until the year 2000. And Jupiter is within our own solar system, one of hundreds of Milky Way galaxy! Mankind hasn't even begun to discover the depths of God's creation and yet most people treat God like garbage by living in sin and committing wickedness. It's hard to understand mankind's unbelief in a Divine Creator in the face of such an astounding universe. How many galaxies are there in the universe? Depending on which astronomer you ask, you'll receive estimates anywhere from 50 billion up to as many as 230 billion, most estimates fall somewhere in between. In 1999, the Hubble Space Telescope estimated that there were 125 billion galaxies in the universe. It is difficult to even fathom such a fact. To help you appreciate what that truly means, let me give you a little information about our own Milky Way galaxy in which our solar system is located. In 2017 the much anticipated James Webb telescope will be launched, sent one million miles from the earth and then activated. The Milky Way galaxy spans 70,000 light years across. Which means that it would take a human being traveling at the speed of light 1,000 lifetimes (assuming a life-expectancy of 70) to cross our own Milky Way galaxy. If it would take 1,000 lifetimes traveling at the speed of light to cross just one galaxy, can you imagine the size of 125 billion galaxies??? That's billion with a "B"
I have a question for you...How big is the universe? Can the universe have an end? Is this possible according to the laws of science? Some people say that the universe is expanding. The Bible teaches that the universe is a fixed size. Psalm 147:4 reveals that God "...telleth the number of the stars; he calleth them all by their names." There is a certain number of stars and only God knows EXACTLY how many there are. As a matter of fact, God has named every one of them. Therefore, the atomic energy in a 200-pound man is 8.18 x 1018 joules. The bomb dropped on Hiroshima released 5.2 x 1013 joules of energy (the same destructive power of 13,000 tons of TNT). This means that the atomic energy in a 200 pound man is 157,307 times greater than the Hiroshima bomb. Most people don’t realize it, but very little of the uranium’s atomic energy was actually released over Hiroshima. First, it is estimated that only one pound of the 15 pounds of uranium was able to reach critical mass and split. Second, only an incredibly small number of atomic bonds were even intended to be broken. Many people think that the atomic explosion was the result of the uranium breaking down completely. In reality, though, the uranium atoms only split in half (making Barium-140 and Krypton-93). Basically, all of the other bonds remained intact. If all of the bonds in the uranium’s atoms were broken, the energy released would have been over 16,000 times greater. God is truly Amazing! Did you know that God loves you and wants you to be present in Heaven with Him when this life is over? It is true. The way to be saved is to believe the Gospel. Repent of your unbelief and turn by faith to the Lord Jesus Christ, the Son of the living God, receiving the death, burial and resurrection of Christ as payment for YOUR SINS, and you will be saved immediately and instantly.